Proper ventilation extends the lifespan of roofs while saving you money from unnecessary repairs and energy bills. Ventilation in commercial roofing Dallas eliminates moisture, the resulting damage of which is the number one cause of roof replacement. It also cools your house in hot climates that results in net savings on your monthly electric bills. Proper air circulation is accomplished through the use of roof ventilation. The primary purpose of roof vent is removing moisture and hot air in the attic and areas under the roof by allowing them to escape outside. Different types and styles of roof vents are available, each of which accomplishes its purpose differently. Some require electric power to function, others use solar energy and wind power, while some work without requiring any power source. Box Vents. These are made of either metal or hard plastic and referred to as static vents because they have no moving parts. They are installed over cuts made on the roof, preferably on the highest possible area near the ridge to maximize ventilation of hot air and moisture, which rise up and escape through the box vents. 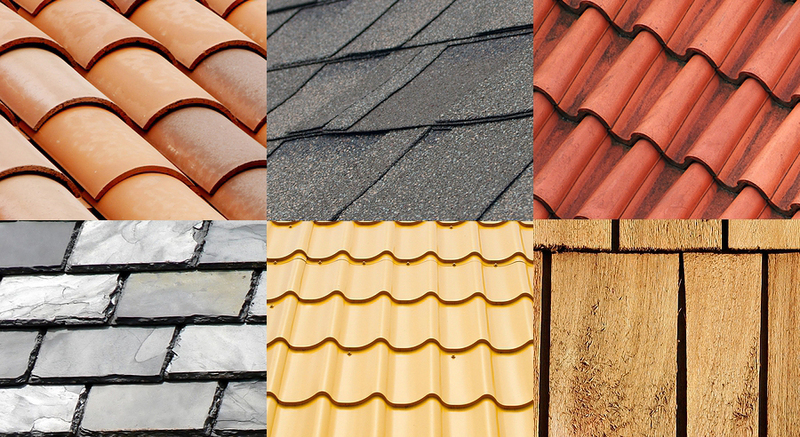 Homeowners can select from among different colors to match their roofs. Off Ridge Vents. These are just variation of the box vents and function similarly. Instead of a box design, this vent style are rectangular in shape. Ridge Vents. 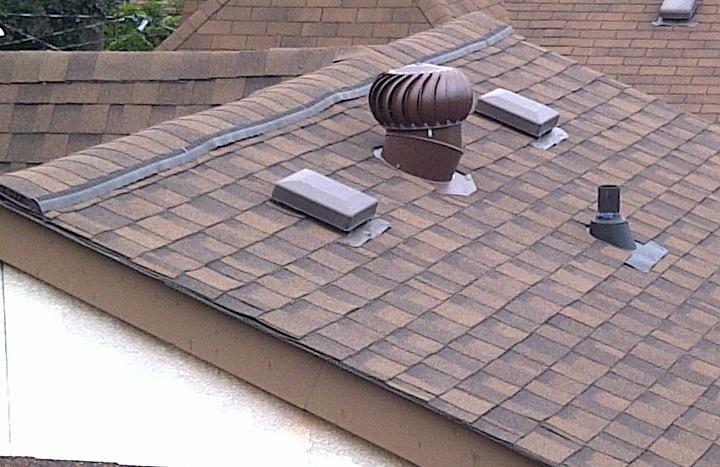 This type of roof vent has no moving parts and does not require electricity to operate. Ridge vents should be installed along the entire length under the roof’s horizontal ridge. An unfinished and relatively unsightly look is created when ridge vents do not run the entire ridge length. Combined with soffit vents, ridge vents are considered the most efficient ventilation system because they create an even distribution of temperature. Power Vents. These have motors built into them that turn large fans inside the device. Some models come with adjustable thermostats – which turns on the fan when a certain temperature is reached – and humidstat – which detects the level of humidity for automatic trigger. The power vents, being equipped with motors, require electricity to work. Some models, however, are powered by solar energy therefore eliminating the need for electricity. Wind Turbines. Unlike the static box vent, wind turbine has moving parts when operating but has no motors and uses wind power to move the turbine around. The spinning action of the turbine draws heat and moisture up towards it and out of the roof. Because of the spinning movement, wind turbine is more effective than a box vent in removing hot air and moisture. Cupola Vents. These are decorative vents found on top of a high ridge and allow hot air and moisture to escape through their openings. Although they function as roof vents, their capability is limited. Spotting a qualified home inspector from a pretender among roofers Denver is not always easy. Knowing how to differentiate one from the other could save you a lot of headaches and money paid to unqualified individuals. Engage the services of a certified home inspector. There are many home inspector associations, some of which have been around for some time and enjoy positive reputation. Get referrals and recommendations from friends and real estate agents on who are the best-qualified home inspectors available. Trustworthy and legitimate agents prefer the services of qualified and reputable inspectors since they want their clients to be fully-informed of the condition of the house, particularly its roof. The average inspector takes at least three hours to complete a home inspection. An inspector announcing that he could do it for substantially-less time should raise red flags on your end. A house will always have defects on it. That is normal. After the owner fixed a problem noted by an inspector, a second visit will take place to verify the repairs made. In many states, the return visit of a home inspector is considered a courtesy call with no extra fees charged against the owner. Always ask the inspectors about their fee policy to avoid misunderstanding. 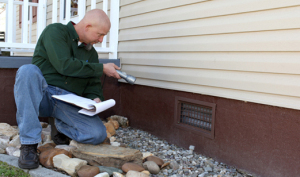 The business of inspectors is to inspect homes. They could be creating conflict of interests if the contractors recommend or suggest a particular contractor to perform a work. If you cannot be present for the entire duration of the inspection, make sure that you can attend at least 30 minutes of it. You can ask clarifications and questions during this time and note which items are considered minor or major. Some inspectors recommend further inspection for things that they do not cover in their work. For instance, a suggestion for a pest inspection may be made since home inspectors are not qualified to conduct pest control inspections. Ask for sample reports on actual inspections made. The average length of a comprehensive report should be about 20 to 50 pages long with pictures of the problems. Errors and Omissions Insurance are obtained as protection in case the home inspectors made a mistake in appraising the worthiness of the roof. In some cases, the insurance company’s liability for such mistakes is limited only to the home inspection fee. More households are using solar energy to power their homes through the use of Miami roofs solar panels. Before using these roof-mounted photovoltaic (PV) systems, homeowners need to understand a few things for them to make intelligent decisions in using this natural and renewable source of energy. Energy Needs. Consult a professional solar contractor to calculate your planned energy usage, not your current or actual usage. You have to consider if your energy needs will go up (growing family) or down (kids going to college). Property Tax. Your property will not be reassessed for tax purposes if you installed solar panels. Reassessment is made only if the square footage of your house increases such as the construction of additional rooms. 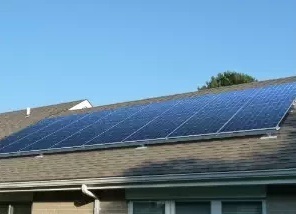 Generally, solar panels installation is exempt from property taxes. Solar Panel Lifespan. A solar panel lasts around 30 years with very minimal maintenance. You only need to hose it down with water and clean leaves and other dirt on the surface, especially during summer. Solar panels lose around half percent conversion efficiency every year. Safe on Miami Roofs. Solar panels should not cause any harm to your roof when properly installed. In fact, they could enhance insulation of your house, particularly the rooms or attic located just below the solar panels. Batteries. Unless you are building a self-contained house in remote areas, you need not to worry about getting power at night because your local power utility will continue to supply you with electricity after the sun sets. In fact, some rebates do not start unless your power system is linked to a grid. Installation Cost. Various roofing styles necessitate different installation costs. Putting solar panels on asphalt shingles costs less than if you put them on shakes or Spanish tiles because the latter are far more brittle and require more care and preparation in installation. Orientation. While southwest-facing roofs are best for solar panels, the orientation of your solar panels is not that important as others may think. Positioning the panels to face south, west, southeast, east or north-northwest is also acceptable. Solar Warranties. Two kinds of warranties are usually offered by contractors – the one on panels and inverters lasting around 20 to 25 years (panels) and 5 to 10 years (inverters) and the other on their work quality, which means that they did not mess up your roof. Insurance Coverage. Get insurance after you install solar panels on your roof. Though you may have to pay the extra premium each month at probably not more than $10, you will be protected from fires and other hazards. While different roofing materials have their strengths and weaknesses, you should not rely solely on these traits when deciding which type to install on your home. You should also consider the area where your house is located. Roofing needs vary in regions with different climates. Before buying a particular roof for your house, you should know the qualities of different roofing materials to be able to choose the ones most suitable for your region’s climate. Metal roofing is extremely durable and could last up to 50 years or more. This roof is ideal for practically all types of climate especially in wet or rainy areas. Modern metals are waterproof and resistant to corrosion. They are also treated to resist against algae infestation. 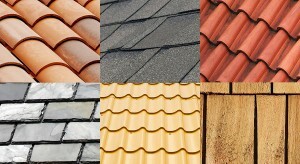 These are more expensive than shingles or metals but they are popular choices for use in hot areas and desert climates. They are good in blocking heat and keeping the interiors cool and at the same time able to resist wind. Unlike other roof materials, we do not recommend this one for DIY practitioners because installing tiles requires special tools and training. In fact, in some areas finding a qualified installer may be hard to do. Houses in places where temperatures are soaring are not ideal for wood shingles and shakes as they tend to crack or split under high temperatures. Places where rain is common is also not an ideal place for this type of roofing particularly when the materials used are not of high quality because they rot easily. Asphalt shingles are durable, inexpensive and attractive, which make them the most commonly-used roofing type in the country. They do well against heavy rain, snow, moderate winds and even minor hail. However, they are not really suited for extremely hot and dry climates since these temperatures tend to shorten the lifespan of the roof by about 20 to 40 percent. In warm climates you can choose light-colored shingles that are better in reflecting heat. This roofing material is very durable and should be good to use in almost any kind of climate. Slate works well in cooling down your house during hot weather. It also performs well against heavy rains. 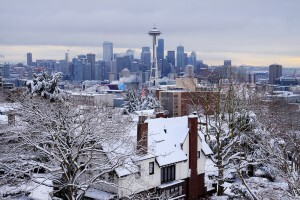 In cold areas, snow could fall for months. While slate roofing is heavy, this should not prevent you from using it. Just do not forget to reinforce your roof to withstand the combined weight of the roofing material and accumulation of heavy snow. Summer is just around the corner. It’s that time of the year when we finally take out those miniskirts, sunglasses, skateboards, and tank tops. The time when we had to curl up in bed reading our favorite books or watching reruns of old videos is over. Going outdoor and soaking in the sun’s light after all those cold winter months staying indoors feel wonderful. Feeling the heat of the sun on our skin is rejuvenating. However, the summer heat can be harsh not only on our body but also on our roofs. They need as much protection from the heat as we do. We compiled some practical tips from roofers Denver that will help you keep your home cool this summer, which in turn keep you and your family comfortable during this hot period of the year. Use the Right Shingles. Asphalt shingles work best in keeping the heat away from your home by their reflective coating. Manufacturers of asphalt shingles use special granules as coating on the shingles to better reflect sunlight. Other materials used to make shingles such as polymer, metal and wood may also be coated to give them better reflective quality. Shingles work best in reflecting the sun’s heat for steeped roofs but are less effective on low-sloped roofs. Buying a cool shingle with white-coated granules costs just about the same as the standard shingles with dark asphalt granules. Use Metal Roofs. If you have a choice, use metal for your roofing material. It is reflective even on its natural state without any paint. Since it may hold heat when exposed to the sun, metal roof is better suited for use in steeped roofs instead of flat or low-sloped roofs. You can further minimize the heat by using a cool roof or a metal roof coated with white color that reflects more of the sun’s heat than darker shades. Plant Trees. Strategically-located trees provide shade to your home against the sun. Plant one near your home to give you that shade and extra cooling breeze during the hot summer months. Do not plant too near your house as to create problems for your gutters with its fallen leaves and dried-up branches. Observe Proper Ventilation. Optimize the use of ventilation to keep your roof cool. Use insulation, soffit, fascia, ridge vent and barrier to maintain proper ventilation and keep your roof and house cool. Paint Your Roof White. One of the easiest and most economical ways of keeping your roof cool. White roofs significantly prevent the absorption of heat by the roof and its penetration into the interior of the house. Use a Mist Cooling System. Spray a small amount of water on a hot roof and watch the water evaporates along with the heat. A more sophisticated system utilizes sensors to monitor roof temperature and trigger the right amount of water. Some people do not just install traditional roofs on houses and buildings in Seattle. They want roofs that not only protect them from the elements like standard roofs but also provide additional utilities or functions. For these reasons, non-traditional roofing systems such as cool, green and solar roofs have become popular choices nowadays. 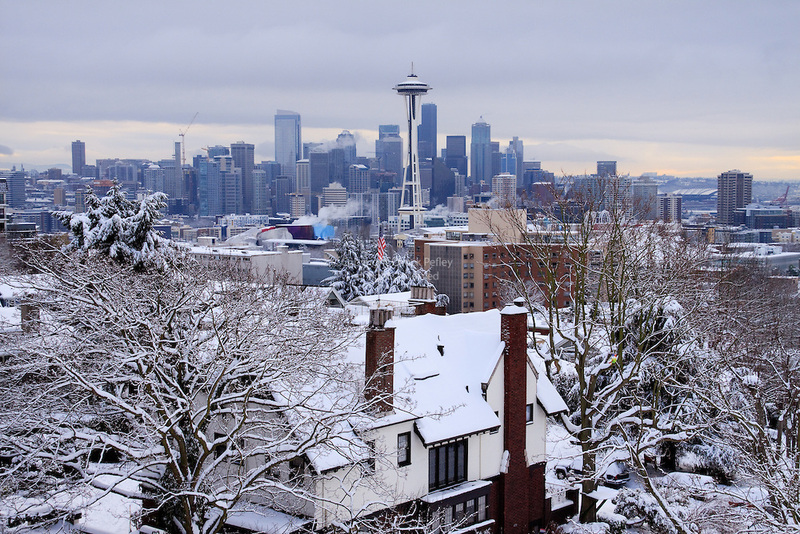 Each type of Seattle roofing has its own benefits as well as shortcomings. How do these roofs fare in cold climates? A study in the Journal of Industrial Ecology gave us the answer. The study analyzed the effects of the three types of roof found on buildings located in different places with a cold climate. It used as models office buildings with large roofs and assumed a 50-year lifespan for the structures. The result showed solar roofs as the definite winner followed by green roofs and white roofs at the rear. A comprehensive approach was adopted for the study, examining not only the energy efficiency created by the different roofs but also their manufacture, transportation and installation at the sites. The study also considered any toxic chemicals used in the manufacture and the effects of the roof types on air, water and human health. White roofs are great for hot weather because they significantly reduce the cooling requirements of buildings aside from prolonging their lifespan. However, in colder climates they actually raise the heating requirements especially during the long stretches of the cold months. Green roofs fared admirably because they lowered both the heating and cooling needs of buildings, enhance the quality of air and decrease storm water runoff. Ultimately, however, solar roofs came out the best option for roofing in cold climates, creating the most impact in the categories considered for the study. While unwanted emissions were created in the manufacture and transportation of solar roofs, these were more than offset by the positive effects of the on-site generation of power by solar roofs. The long-term use of solar energy is a major positive factor because it reduces the need for coal-powered energy and other fossil fuels by the buildings. By reflecting the sun’s heat, the solar panels reduced the temperatures of the buildings during the hotter months although they tend to slightly raise the heating needs during the colder months because of the reflectivity of the solar roofs. Engaging the services of Denver roofing contractors for difficult roofing work is not a straightforward undertaking. 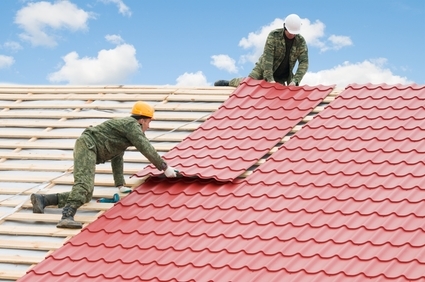 While most contractors are honest in their dealings, some roofers simply cannot be trusted. Knowing how to spot these dishonest contractors makes a difference between spending the right amount for the work required and losing hard-earned savings to unscrupulous contractors. Contractors can shorten the completion time of a project by saving on labor time through the use of shortcuts. Houses that are greatly damaged by hurricanes have poorly-secured roofing and substandard framing. 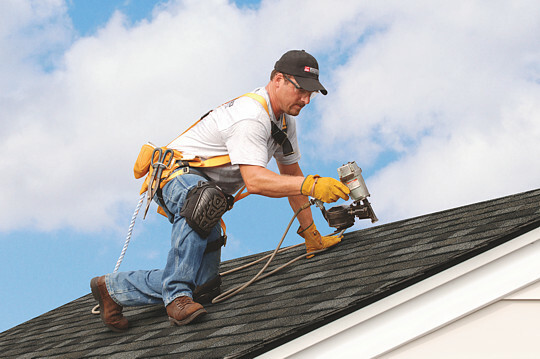 The most common cause of shingles getting blown by strong winds is the inadequate use of fasteners. Shingles tend to buckle and eventually lift or separate when subjected to strong winds, which raises the risk of rainwater leakage. By skimping on the basics, roofing contractors manage to complete a project in record time while saving substantial money from the reduced number of materials and labor needed to finish the roof. The result is a poor and substandard work that is prone to all kinds of damage and disaster. Dishonest contractors under a package contract with homeowner will intentionally wait until the project is well under way before advising their client that a certain product is no longer available, and offering a more expensive substitute or upgrade for the discontinued product. Another common dishonest practice for roofing contractors is substituting low-end materials for the high-grade ones that were agreed upon. For instance, they could use galvanized nails instead of stainless steel nails in fastening cedar shingles. Distinguishing the difference between nails just by looking at the nail tops on the roof surface is difficult. Other contractors use sheet metal drip edge in place of aluminum drip edge, which most homeowners cannot easily distinguish. Knowing the prices of the different materials that your contractor will be using on your house is advisable. Directly inquire from the suppliers the wholesale and retail prices of each item. If your contractor intends to add a markup on the prices, set a cap or limit in your contract to avoid overpaying for materials that could have been purchased at much-lower prices. Contractors can increase their profits and save on labor costs by skipping preparations. Roofing, painting jobs and wall/door installations are the more common works where violations of this kind are committed by dishonest contractors. Painters may skip on primer or paint only the newer seams. Roofers could apply substandard tar that dries out in a short time and fails to provide protection against leaks. The advent of green roofs reflects the collective awareness of the masses on the greenhouse effect of fossil fuels that ultimately leads to global warming. Preventing this unwanted climate change led to the production and use of various roofing materials that help protect the environment. Below are some of these most common roofing materials used for green roofing Columbus, Ohio and their benefits as well as disadvantages. Woods gathered from sustainably-growing trees are ideal for people who prefer classic wood shingles for their homes. These are also biodegradable and made from natural materials. Unfortunately, wood shingles are expensive up front and flammable, which limit the options of those living under controlled areas or where the occurrence of fire is high. Manufacturers came up with shingles with recycled contents that resemble wood shakes and slates. They have a long life span and are recyclable, providing an excellent choice and low-cost alternatives to the more expensive slate and wood tiles. So far, no recycled shingles are available in white, which would truly make the roof a cool roof. Their durability make slate and clay a favorite among homeowners. They also project that natural and classic look that augments the elegance of historic-designed homes. Clay tiles are cool roofs and therefore enhance the energy efficiency of your homes. They are, however, very expensive with prices almost double those of metal roofs. Their weight might also require houses to be reinforced prior to installation, which further adds to the cost. Further, regular maintenance is required to replace damaged tiles. The number of homes equipped with solar panels are rising. The increase is a testament to the proven benefits that solar panels bring in terms of huge savings from energy bills. Using solar panels also means relying less on fossil fuels. A big disadvantage of solar panels is their huge upfront cost. While you may save money in the long run from electric bills, it will take years before you can recoup your investment. A cool roof is painted with light color to reflect sunlight and minimize the absorption of heat by the roof, resulting to the cooler interior of the house. This method promotes energy efficiency while curbing the urban heat island effect. A cool roof does not automatically mean that it is eco-friendly. The material used could have been made from asphalt shingles, which are petroleum-based and non-recyclable. The benefits brought by a green roof are many and varied—it provides insulation to your home, helps reduce heat island effect, cleans the air, and enhances the beauty of your home. The initial installation cost is high though. Regular maintenance is also required to keep the plants healthy and the roof in optimal condition. 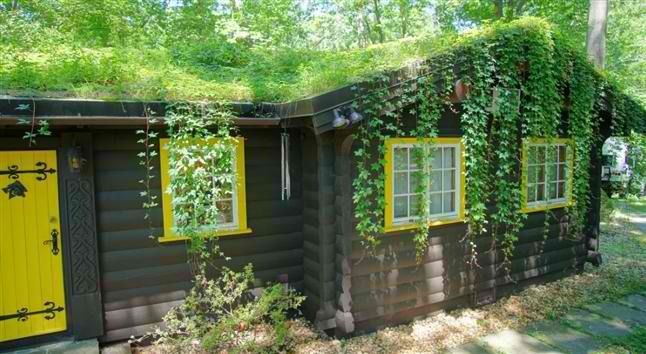 Repairing areas under the green roof could prove difficult and costly too. Many businesses from different sectors are contributing in the fight against global climate change and its unwanted consequence—global warming. The roof repair Fort Worth industry is doing its share through innovations and new technologies by producing eco-friendly or green roofing materials. Green roofing products in Fort Worth are diverse and come from different materials, including recycled metal, wood, rubber and plastic shingles. The choice of materials depend on your budget, house design, objectives and local regulations. Many homeowners choose slate tiles because of their durability—they can last practically hundreds of years. Mining slate and transporting it, however, are energy-intensive. Fortunately, options are available to use and install salvaged slate and clay roof tiles. Perhaps the “greenest” among roofing products are shingles made from recycled waste materials that include wood fiber, rubber and plastic. Some of these come from post-industrial waste and clean post-consumer waste. These recycled shingles look good and are remarkably durable that you would not guess they came from waste materials. Most metal roof products contain recycled materials. Because of their durability, metal roofs need not be replaced for up to 50 years—making replacement less frequent and producing less waste in the long term. Metal roofs are ideal for houses located in snowy parts because snow tends to slide off the roof, preventing the formation of ice dam. Some companies manufacture rustic shingles created from recycled aluminum, which look like wood shakes. Others produce metal shingles with up to 50-100 percent recycled materials that resemble slate or wood. Reinforced rubber shingles are created from tough steel-belted radial tires and coated with ground slate. Manufacturers give 50-year warranty for the product, a reflection of its durability and long life, against extreme weather conditions, including hail. We suggest checking your local codes to see if rubber roofs are allowed to be installed on homes. A popular choice among homeowners for roofing materials are wood shingles and shakes, which come from western cedar trees. However, harvesting old-growth trees is not environmentally-friendly and sustainable in the long term. These materials are also prone to combustion and not safe to use in areas where forest or brush fires are common. If you prefer using wood for your roof, consider products made from recycled lumber. Wood reclaimed from bridges, water/wine tanks mills and other sources are turned into roof shingles. You can also opt for shingles and shakes made from sustainably-grown cedar trees.